I learned years ago that preparing a complicated dish so as to impress a diner is easy. You need training or practice, preparation time, the best ingredients, money and the right tools. But to prepare a simple course, so as to elevate it to impressive levels is the mark of a talented chef. Few people care enough to do it, or know how. Chef Paul at D.O.C. wine bar in Lombard does both. Everything on the “Butchers Plate” was skillfully prepared and arranged. If you’re not overly hungry, this 8 item plate is enough to share and satisfy. At $26, it earns the “Mizer” award for being wallet friendly. And you’re guaranteed to like your selection because you choose it from a list of 9 bruschettas, 14 cheeses and 10 cured meats. The cheese selection, by the way, is excellent. It is all too common to be offered a cheese plate with offerings no more exciting than common supermarket cheese. Not so at D.O.C. On Sunday, the wine flights are half price (a “Mizerly” recommendation). But a look-see on their web page shows there seems to be something special every day. The flights are grouped by taste descriptor, particularly helpful for novices. We began with “Apples & Peaches” and “Apricots & Oranges.” Actually, we began this flight before the charcuterie. Apples & Peaches was a sampling of a “Blanc De Pacs” from Spain, a Gruner Veltliner from Austria and a California Chardonnay. The “Apricots and Oranges” was a sampling of a Piedmont Moscato D’Asti, an Australian Dry Riesling and an Oregon White Blend. I enjoyed the variety of offerings. If you’re new to wine, these flights are a great learning opportunity. If you’re a seasoned oenophile, you’ll enjoy - if not new varietals – new labels. We moved on to “Pears & Melon” for her (a Vouvray from Ch. Moncontour), an Italian Pinot Grigio and a New Zealand Pinot Gris. The Pinot Gris was so similar in its profile to that grown in Oregon (yes I sipped hers) that I knew this was going to be fun. For myself, I chose “Red & Black Cherries” which was a Willamette Valley Pinot Noir, a Spanish Grenache and a California Merlot. D.O.C. is a wine bar after all and one that lives up to its self description. I’ve visited more than one wine bar and left disappointed. How long are bottles kept before being discarded? What about selection? Can we explore more than the Chardonnay-Chardonnay-Chardonnay-Pinot Noir-Chardonnay offerings? D.O.C. offers 8 wine flights, each containing 3 different wines. Malbec and Carmenere and Zinfandel, oh my! Blends & Blancs , and Chablis to please! O.K. enough silly attempts at poetry. D.O.C. has an excellent wine list that any experienced wine lover will enjoy. We were done with the flights. My companion chose a glass of Chardonnay. I was enjoying the quiet expertise of our server Paul, and decided to test him. I asked him to bring me a glass of wine that he thought I would enjoy (based on my red wine flight). He returned with a 2009 Alexander Valley Meritage (Farrier Wine Co. California), a blend of 51% Cab Sauvignon, 40% Cab Franc, 8.1% Merlot & .9% Carmenere. Paul’s instinct was spot on! The modest but enjoyable red blend offered black currants, blueberry and violet with soft tannins and a lingering finish. With just a little room, but a lot of curiosity left, I ordered the “Filet Duo” Signature Slider plate: two mini filet sandwiches with reggianno crema and roasted red peppers. Paul knew we wanted to share and returned with sufficient plates. The Sliders come with a choice of sides. We chose roasted asparagus. Remember my comment about preparing a simple course so as to elevate it? The sliders in the reggianno crema were perfectly done and tender. I expected them to be delicious and they were. But it was the asparagus that impressed because, after all, it is the side that is so often slighted. Chef Steve’s preparation elevated and impressed. The stalks were as tender as the tips, yet crisp throughout. Every piece, every section equally cooked and seasoned so to delight the senses. D.O.C. Wine Bar in Lombard in conversation friendly. Seating is available in the bar or dining room. 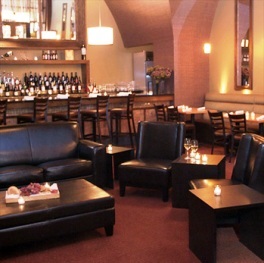 Parties can be held in the private room and bar. 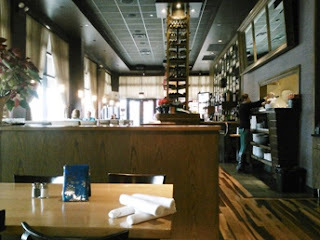 Our server (Paul) was wine knowledgeable, attentive without being intrusive and timely in anticipating diner’s needs. In complementing his service to management, I was assured all the servers are knowledgeable about wine. Looking at the faces of other patrons as we left, everyone seemed to be happy, and the manager was likely correct. D.O.C. has another location on Clark St in Chicago.